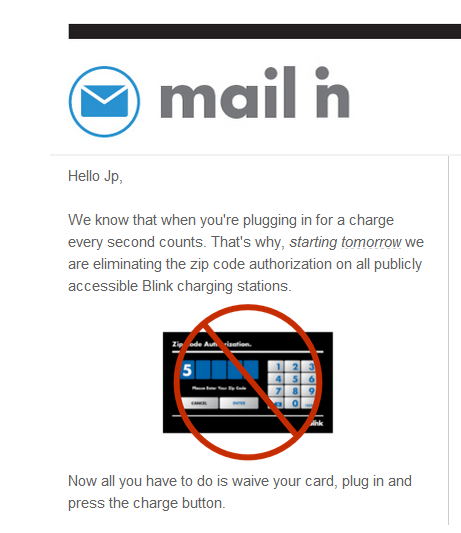 Blink Networks have just announced that with immediate effect all of the 4,000 public charging stations in their network will no longer require a ZIP code to be entered to begin a charging session. Hurray!! This is a very welcome change making the charge process much simpler. Up until now entering a zip code was an extra step, that on some units with badly calibrated screens, was almost impossible to accomplish. This may seem impatience by EV drivers, but it is not laziness, when it is raining the entering of the ZIP code can make the experience unpleasant. EV charging stations typically aren’t under a canopy like gas pumps. This entry was posted in Blink, Electric Car, Level 2 EV Charger, Level 3 EV Charger, Nissan LEAF. Bookmark the permalink.